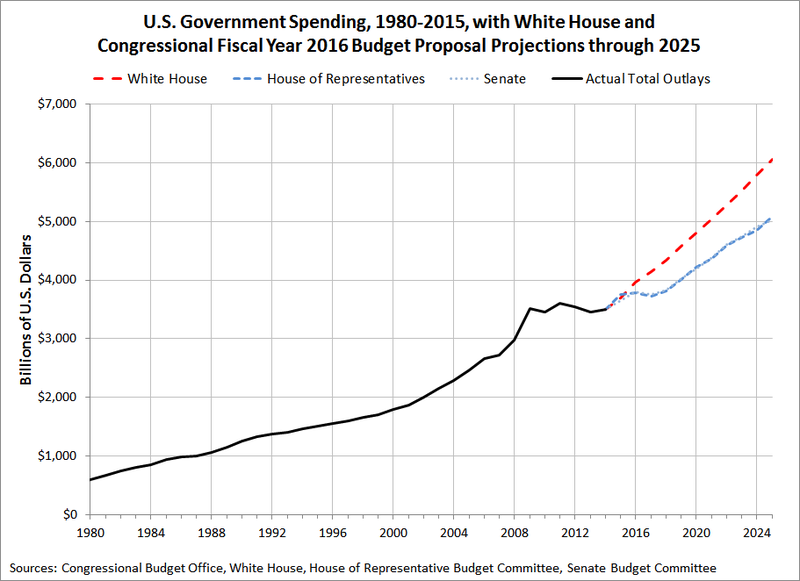 In the chart, we can see that all the budget proposals greatly increase the federal government’s spending over the next 10 years. 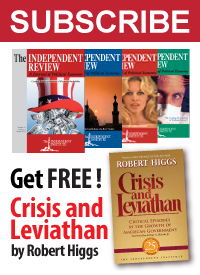 The difference however is that President Obama proposes that the U.S. government spend money at an exponential growth rate with respect to its historic trajectory, where by 2025, the U.S. government would be spending $1 trillion more than either the U.S. House of Representatives or the U.S. Senate propose. Besides this difference in spending, President Obama also proposes higher taxes to offset the negative impact of his higher spending on the fiscal condition of the U.S. government. Even with those projected higher tax collections, the CBO’s analysis of the President’s budget proposal confirms that the U.S. government will run progressively higher deficits year after year, adding trillions of dollars to the nation’s total public debt outstanding. By contrast, the House of Representatives’ and Senate’s budget proposals would not impose higher taxes, but their slower rate of spending increases would lead to progressively lower deficits over time that would minimize or potentially eliminate the U.S. government’s annual budget deficits, where the growth of the U.S.’ national debt would at first be greatly slowed and potentially reversed. There are some differences in how the House’s and Senate’s respective budget proposals each achieve that goal, which will be resolved as the U.S. Congress’ budgeting process moves forward before the federal government’s overall blueprint for future spending will be sent to the White House. White House Office of Management and Budget. Budget of the United States Government. Fiscal Year 2016. Historical Tables. Table 1.1 – Summary of Receipts, Outlays, and Surpluses or Deficits (-): 1789-2020. [Excel Spreadsheet]. February 2, 2015. Congressional Budget Office. An Analysis of the President’s 2016 Budget. [PDF Document]. March 12, 2015. U.S. House of Representatives Committee on the Budget. Fiscal Year 2016 Budget Summary Tables. [PDF Document]. March 18, 2015. U.S. Senate. A Balanced Budget That Supports Economic Growth and Expands Opportunity for Hardworking Families. Summary of FY2016 Budget Resolution Chairman’s Mark. [PDF Document]. March 17, 2015.